Leeks are my vegetable nemesis. I like leeks, enjoy their rich, onion flavor. I also think they look quite lovely. But some of my biggest flops in the kitchen have involved leeks. Their flavor is so strong, and turns so quickly and easily. I once tried to adapt a sweet potato and leek tart with, I think, potatoes, cheese, orange peppers and leeks. Maybe the grossest thing I’ve ever tried to eat. I think we ordered pizza that night. So this time, I went with a tried-and-true combo instead of re-inventing the wheel. I’d never made potato leek soup before, but I’ve eaten and enjoyed it many times. I found this recipe from Bon Appetit, and stuck by it to the letter. The verdict? Delicious, if time-consuming. While you do have to put in the prep time to chop lots of veggies, the simmer time to tenderize them, and then the rotating puree into a blender, this creamy soup also has the additional step of returning to the pot for added cheesiness. 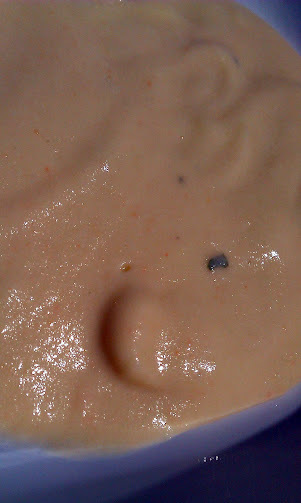 Once again, I found myself longing for an immersion blender. Maybe my next kitchen investment. All that said, if you have the time, this soup is a great way to warm the kitchen on a cool winter Sunday night. Serve with crusty bread, mix in a few gnocchi for texture, or swirl in some of that pesto, and warm your insides, too. What are your favorite winter recipes, or vegetables to feature in the colder months? Leave a comment and share your favorite roots with all of us!